How to buy a good used hatchback under Rs.3 lakh? If you are out looking for a used hatchback, the chances are that you are very confused about which car to go for. With so many options to choose from, that comes as no surprise. So which car should you buy and what is the right price for it? Read this story to find out exactly that! First off, decide whether you want a petrol car or a diesel car. With the difference between petrol and diesel prices it seems like an obvious choice to go for a diesel car. If you are paying Rs. 1 lakh more for diesel car, then you should at least by driving 1,000 km per month, to just recover that cost. If your monthly run is 500 km, then you shouldn’t buy diesel car if it costs more than Rs. 50,000. Also read: 5 reasons to buy a used car instead of a new one! So which hatchback should you go for? You will essentially find cars from different segment in this very price band of under Rs.3 lakh. 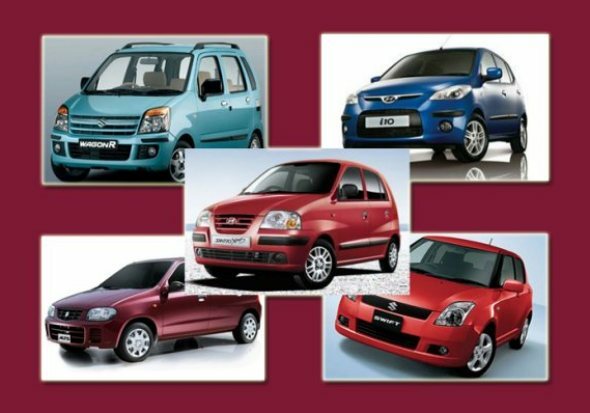 Your best options include the Maruti Suzuki Alto, Maruti Suzuki Wagon R, Maruti Suzuki Estilo, Maruti Suzuki A-Star, Maruti Suzuki Swift, Hyundai Santro and the Hyundai i10. All these cars are easy to maintain, have a good engine life and will be available at lucrative prices. Also read: How to buy a good used sedan under Rs.8 lakh? You will find a lot of good cars under Rs.3 lakh, especially if you opt for not so popular cars like the Estilo or the A-Star. What options do I have among petrol hatchbacks? As a second hand car, buyer reliability, service costs, product life and quality should be your main criterion for selecting a car. The best options in petrol will include all the cars mentioned above. You will be able to purchase a 2009 Alto or 2004-2005 models of the Santro, or the earlier version of the Wagon R for Rs.1 lakh to Rs.1.50 lakh which would have clocked 50,000 to 60,00 kms. Here the reading on the odometer of the car comes into play as a deciding factor. A newer car will usually have clocked lesser kilometers which means it will have a lot more life. For a car like the Swift which is popular and has good resale value an odometer reading of anywhere between 30,000 kms to 60,000 kms is a good deal. If a car has crossed the 70,000 km mark then you should ensure you bargain on the price. What options do I have among diesel hatchbacks? If you are out looking for a second hand diesel car, a good deal will be harder to come by. Your options will include the Tata Indica, the Fiat Palio and the Swift. It is best to steer clear of the Tata’s and Fiat’s unless you are getting a car which has clocked fewer than 20,000 kms and is available at a good price. This is primarily because of maintenance issues and the cost of owning these cars. If you are buying a car that was used as a cab, then you need to proceed with even more caution. You can read about how to go about buying the car here: 5 steps to buying a used car in India. So your only real choice is the Maruti Suzuki Swift, a 2007-2008 model Maruti Suzuki Swift with 45,000 kms to 50,000 kms will be available at a price of Rs. 2.65 lakh to Rs.3 lakh and upwards. The price depends on the condition of the car, whether all its papers are in place and whether it is well maintained. If you can stretch your budget, you might find some good deals on the last generation Hyundai i20, the Skoda Fabia or the Chevrolet Beat, but these again are cars that are hard to come by. How do I decide whether I should buy an entry level hatchback or a premium hatchback? So if you are buying a petrol car and are on a tight budget a next to new A-Star, Estilo or even a relatively older Santro will be more practical for you. It is at the end of the day a matter or mind over heart.